Why is it so challenging for us to develop productive and meaningful approaches to conflict when conflict, in varying degrees, is something we live with daily? Conflict is a normal and inevitable aspect of our lives that can be a stimulus for positive change, and yet, the language we use in describing conflict increases the likelihood that we will adopt strategies that will, prolong, ignore, or even have the effect of escalating the conflict. If we change our language, we discover a radical new way of thinking about and addressing conflict. Three words that are commonly associated with the word conflict are prevention, resolution, and management. When we talk about conflict as something to be prevented, resolved, or managed, the image we create is something to be impeded, avoided, suppressed, and confined. From this view of conflict, we might internalize narratives such as, “If you don’t have conflict now, then you need to make sure you don’t have it ever,” or, “If are you in conflict now, then you need to fix it, or confine it to minimize its impact.” The language we associate with conflict has two effects. First, the language as described above reinforces prevailing negative associations and attitudes that conflict is something painful and undesirable. While this might reflect what we experience when we are in conflict, it ignores a fundamental truth about conflict. Conflict is a natural part of human interaction. It is likely that we all have experienced conflict with a romantic partner, a family member (parent, child, sibling), a coworker (colleague, boss, subordinate), a neighbor, and a friend. We experience conflict in every arena of our lives, and if we have interacted with other human beings, then we likely have experienced conflict. If we view conflict as only negative, then we treat it as something undesirable and avoidable, and we deny its inevitability. Whereas if we acknowledge conflict as normal and inevitable, then we can learn to integrate it into our daily lives and leverage it for positive change. Second, our language encourages us to develop unhelpful approaches to conflict. When we treat conflict as only negative and as something to be avoided, we subsequently develop strategies to ignore and deny the existence of conflict, rather than dive in and confront what needs addressing. If we think of conflict as something to be fixed, then we might rush to a resolution without giving full attention to the various dynamics fueling the conflict. If we treat conflict as something to be suppressed, we might encourage conversations to include as few people as possible, ignoring others who are directly or indirectly affected by the conflict. To change our attitudes and approaches to conflict, we first must change our language. 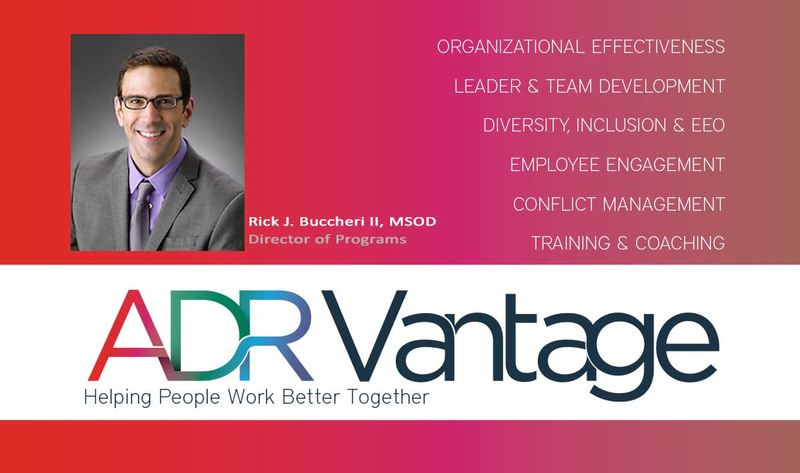 If the language of conflict prevention, conflict resolution, and conflict management encourages unproductive attitudes and approaches to conflict, then conflict engagement may offer a different, and immensely more useful, way of thinking about and approaching conflict. So, what does it mean to be engaged? Current academic research points to a three-pronged definition of engagement. To be engaged in something means to be involved, energized, and enthusiastic. To be involved means to actively seek opportunities to perform the task, and to do the task whenever it requires being done. To be energized means to be motivated or incentivized to perform the task. To be enthusiastic means to be excited by the task, to look forward to it, and be passionate about it. If we apply these concepts to conflict, we are presented with a radically different conflict philosophy. To be involved in conflict would mean to seek opportunities to enter challenging or difficult conversations rather than avoid them. It would mean acknowledging when conflict exists, and looking for ways to unpack the conflict in collaboration with others who contribute to or are affected by the conflict. To be energized by conflict would mean to be motivated by the positive benefits of addressing conflict head on. Conflict often becomes destructive when it is ignored or when we apply hurtful or damaging conflict strategies. However, when we take part in meaningful dialogue, and seek to understand others involved, working through conflict can produce clearer shared understanding, deepened relationships, and innovative solutions. If we focus on these positive aspects of being in conflict – without ignoring the difficult and uncomfortable aspects of being in conflict – we are more encouraged to step into hard conversations and work toward shared goals. To be enthusiastic about conflict would mean to feel enough of a sense of competence and confidence in our ability to productively work through conflict that we are willing to initiate what might be a conflict conversation. Unfortunately, although we have lived our entire lives in conflict, most of us have an underdeveloped conflict skill set. 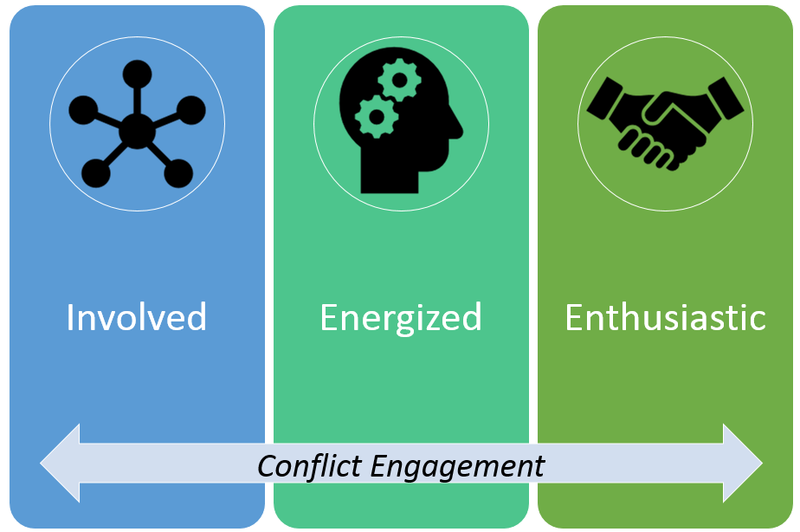 Cultivating enthusiasm for conflict engagement would encourage us to strengthen the skills and strategies we bring into conflict conversations. Refreshing our language from conflict prevention, resolution and management to conflict engagement gives us a new template for our attitudes and approaches to conflict, and provides a shift that will help us acknowledge conflict that already exists, step into conflict more willingly, and develop a more effective set of skills to help us navigate conflict. This month, as we celebrate conflict resolution month, let us also focus on new directions for our field of practice.